Make a website in a few easy steps. Our beginner tutorials are full of information that will teach you step by step how to create a website. Before you start to learn some of the best ways to make a website there are a few things you should think about. Is the site builder that you use user friendly? Can you try all the features on their web-page-builder before you buy? If you decide to sell products online at a later stage can you? Is their web hosting reliable and fast? Do they have online support? Make a website in a few easy steps. Our beginner tutorials are full of information that will teach you step by step how to create a website. No skills required to make your own website. In this step-by-step guide you will learn how to setup a fully functional, great looking site. No design or HTML coding required. The first step is to choose your domain name this will be your site address and how people will find your site or blog you make. You can register a domain name at a domain registrar for about $10 for one year. Its a good idea to register your domain for at least 5 years or even 10 years, its cheaper and Google knows you mean business and it could help you to rank higher. When you make your own website include your main keywords in your domain, choose a registrar that has stood the test of time and has an easy-to-use dashboard like GoDaddy, it’s one of the biggest and best domain registrars in the world and you won’t have any problems with them. We will show you two of the best ways to make a website, the first way is to make a website using a web site builder and then we will show you how to make a website with WordPress. What is a Website Builder – Web site building software that can be used by a person to create their own site or blog with no HTML coding knowledge. Its easy to use and does all the HTML coding for them. Hosting, free templates and sometimes a free domain is included in the software, you can even create a free website. People can select a template, add text, images, videos, contact forms and lots of other features and learn how to make your own website with little or no design experience. They can easily make new webpages using the software, those pages are available on the internet. How to Create a Free Website – Free site builders are limited and you can make a free website but you can not make a professional website unless you upgrade. This means you have to pay to try their webpage building software. If you are not happy you have the hassle of trying to get your money back. What do you want? Waste your time and make a web site for free that won’t get visitors, or learn how to create a website that works and brings in lots of business online. Selling Products Online – What happens if you decide to start selling products online does your web site builder have eCommerce software or will it cost more? Its important to start with the best website builder that has all the features you need and more to get an online presence. One that not only lets you try the full system free but also allows you to make your own site and if you decide to sell products online later it won’t cost any extra. What is the Best Website Builder – Easysite has all the features you need to make web pages, you don’t need to know how to make a website using HTML their web building software does all the HTML coding for you. There are lots of different types of webpage builders that offer the world, but few are as good as Easysite and let you try all the features free for 30 days. Start For Free – Start building your site for free! No upfront payment, no credit card needed when you make a web site. Free Domain Name – Free domain of your choice after your initial payment, or use a domain you already own from another registrar. Professional Templates – Choose from lots of free professional templates to get the look and feel you want. Change the template at any time, or get a custom template made for you. Make a Website – You will find it very easy to use, add pages, images, videos, social share buttons and more. 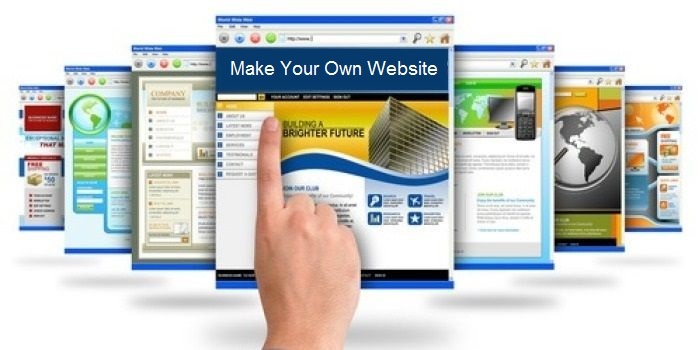 It really is the easiest way to make a website you can try it free for 30 days. Shopping Cart – Have a shopping cart and sell products it won’t cost you any more the full system includes eCommerce software so if you decide to sell goods you don’t have to upgrade and it won’t cost you any extra to have an online shop. SEO Friendly – Add Title tags, Description tags and Keywords to each page in a few clicks. Top-Level Fast Hosting – Top-level, fail-safe fast hosting from multi-homed providers. This lets you have unlimited visitors to your site with maximum up-time. Great Support – Free telephone and email support from a great team. Below you can learn how to make a website using WordPress, find out what is WordPress and how it works. Our beginner WordPress tutorials will guide you on how to set up WordPress. What is WordPress – WordPress is a free and open source blogging tool and a content-management system based on PHP and MySQL, which runs on a web hosting service. Features include a plug-in architecture and a template system. To make a website using WordPress you will need to register a domain name and sign up to a hosting service. How to Design a Website using WordPress – There are thousands of free WordPress themes and premium WordPress themes that you can use to design your site, do a theme search and install and activate the WordPress theme you would like to use, easy as that. Use free WordPress plugins to make each page SEO friendly, add contact forms, slideshows, image galleries, videos and what ever other features you require. Make a website to share your ideas and thoughts with the world. Or make a business web site that not only looks good but brings you more business. Today anyone that can write a few good paragraphs and click a mouse can learn how to make a website from scratch, no previous web design knowledge or HTML coding needed. Web site building software like Easysite and WordPress are all you need to create your own web site and save money by doing it yourself. WordPress is free web site building software that must be installed on to a web hosting account. There are lots of hosting company’s to choose from some better than others. When you search for hosting be careful of free web hosting and cheap web hosting. Its like buying a cheap car it always breaks down you get what you pay for, don’t use free web hosting or cheap web hosting when you create a website using WordPress. Your pages should load fast and to load fast you need fast web hosting and paying a few dollars more for hosting is money well spent. It will really make a big difference to your sites over all performance. How to Make a Website with WordPress – Once you have signed up to a hosting service you will be able to sign in to your hosting C Panel and download and install WordPress software on to your hosting account. Watch our WordPress training videos, its very easy and quick. Need Help? – If you require help please email me before you sign up to hosting and I will save you some money and install and set up WordPress on your hosting account for free. Check your Email – Once you have downloaded WordPress you will receive a email with a link, your username and password, click the link and sign in. WordPress Dashboard – You are now in your dashboard and can start to set up your WordPress-web-site, change the theme add content and start to make your website. Any site you make should be fast loading and available 99.99% of the time hosting is important. Create a website with Easysite get a free domain and web hosting. Make your site in a few easy steps no HTML or web design knowledge necessary. Add a shopping cart, sell goods online directly from your site no upgrade needed. Lots of helpful step by step video tutorials to watch and learn. Easysite is SEO friendly so your site will rank high. Try it free for 30 days no credit card required. Find out how to make a website with Easysite. Make a website with WordPress sign up to hosting download and install WordPress and in no time at all your site will be live on the web. Choose from thousands of free WordPress themes to get the design you want. Make your own web site and publish it on the internet. Learn how to make a website using WordPress. Remember when you learn how to build a website yourself you not only save money but you will be in full control. Add content and updates when you want. Building your own website is the right thing to do.